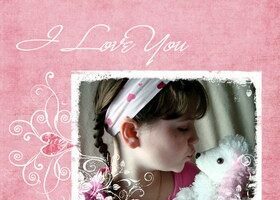 Need handmade Valentine card ideas? 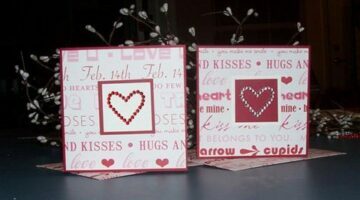 See how I made both of these Valentine cards using only a heart punch, alphabet stamps, and leftover paper scraps. You can use these tips for ANY type of card just by changing the punch! Need a quick card for Valentine’s Day? These 2 cards with matching envelopes can easily be made using 2 decorative sheets of paper, heart stickers, and 1 sheet each of red and white paper. 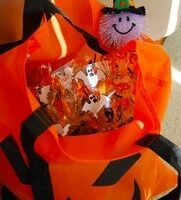 If you’re looking for a small Halloween gift or giveaway for a Halloween party, these Halloween gift bags are ideal. They’re simple to make, and can be personalized any way you like. There’s a new form of stamping on the rise. It’s called digital stamps or digi stamps! Here’s everything you need to get started with digital stamps, including what digital stamps are, where to find them, and how to make your own. DIY Halloween Gift – An Idea That Could Be Used For All Kinds Of Seasonal Decorations! 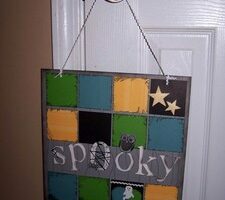 Following are the steps I used to make the spooky Halloween door hanger pictured above. But you could adapt this same idea to make any type of seasonal craft for any time of year. Chances are you have several rubber stamp sets sitting around that either already served their purpose OR they have so much dust on them you can’t even read the title on the package. If so, then you’re a great candidate for hosting a stamp swap! Here’s how to organize a stamp swap. So many colors, so little time! Following are all the reasons that I completely adore the Close To My Heart dye-based inks. This card was for a colleague who is leaving for a new job. I have now been recruited to make a card for every event in my office! For this one, I used my Cricut machine and a Sharpie marker, in addition to colored papers. Making scrapbook pages for Valentine’s Day is one of my favorite pastimes because there is so much you can do with a page about love, hearts, relationships, and memories. 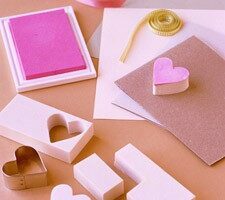 Here are my 10 best tips for making Valentines Day scrapbook pages. 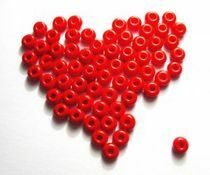 Here are 7 fun things you can do with your rubber stamps to create gifts and decorations for Valentines Day. Following are some fun ideas for New Year’s resolutions for those who do scrapbooking or rubber stamping. Perhaps they will be useful in helping you to start thinking about your own resolutions this year. Here are some ideas of fun things you can do with Christmas stamps. 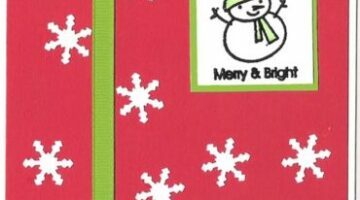 Everything from make special gifts that are personalized to making your own wrapping paper and gift tags. Ever wonder how you could make some money using your stamping and scrapbooking supplies? Here are 5 ways, plus a few more from other scrapbookers and rubber stampers. Here are some ideas for using Halloween rubber stamps to spice up your Halloween holiday. There are lots of fun ways you can utilize your Halloween rubber stamps in craft products and holiday decorating themes. You can use MSN or Yahoo groups to find other scrapbookers or stampers who may not be local for you, but if you want to actually get together with others you can try Meetup.com. If you’re like me you have sheets of rub-ons that are half-full — in the same box as the half-used sheets of stickers. Now that Stampin’ Up has rub-ons that coordinate with their stamp sets, there is a new technique using the new product. 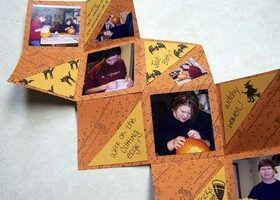 If you have any stamps with line images, you can create a page or card using the paper piecing technique. Images are typically colored with marker, watercolor pencils, chalk, etc., then cut out and arranged. 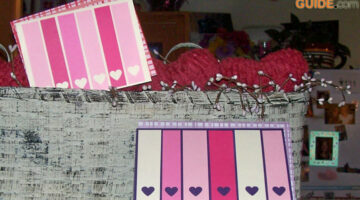 Stampin’ Up has a great sample using the Happy Heart Day stamp set. Using plain self-adhesive address labels that you can buy just about anywhere, you can create a mosaic look for cards and scrapbook pages. The Christmas Holiday is over, and I missed out on getting handmade cards out to many of my friends and family. As a way to make up for that — at least in my mind I can make up for it — I can send out a handmade Thank You card for those who’s gifts meant so much to me. Your kids can help with this card idea – using a snowflake punch, ‘make’ some snowflakes that they can glue to cards to create their own designs for giving to friends, teachers, or anyone else who is special in their life. 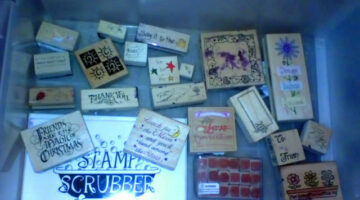 Use Rubber Stamps For Your Gift Boxes And Gift Bags! Stamping handmade cards is a great way to show your friends and family that you care very much for them. Another way to use your stamps — and other creative talents — is to dress up your packages and gift tags.